Wash vegetables and peel the peppers, remove the seeds. Put aside 1-2 tomatoes, 1/3 cucumber and bell peppers. Peel the rest of the tomatoes. To do this, skin the large tomatoes: make a crosswise incision on the tops, plunge into boiling water for a few seconds, drain and pull off the skin. Cut peeled tomatoes into 4 pieces. Peel rest of the cucumber, garlic. Dice the cucumber and bell peppers. Put vegetables in a blender bowl. Mix the vegetables, garlic in the bowl of a food processor or blender. Add the olive oil, vinegar or lemon juice and tomato paste, salt and pepper to taste. Blend the components in mixture until smooth. If the soup is too thick, add cooled boiled water to your taste. Pass the purée through a fine metal sieve, pouring it in a deep bowl. Leave a half of the chopped vegetables for decoration, and add the rest into the vegetable puree. Mix the puree again and taste. Add salt, oil, vinegar, pepper or water to your taste. It should not be thin, should have a strong flavor. 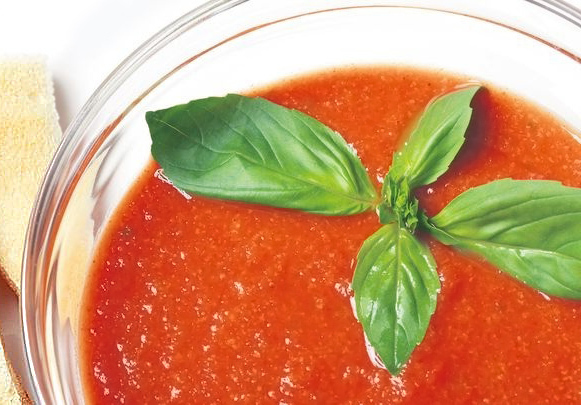 Refrigerate the Gazpacho soup until well chilled (you can add ice, instead). Dice the toast or white bread. Fry the diced bread in olive oil. Before serving, decorate each chilled gazpacho bowl with sliced vegetables and chopped greens. Fried bread served separately, to add it into the dish to your own taste. You can serve the Gazpacho with garnishes of your choice: diced black or green olives, hard-boiled egg, cubes of ham. Greens like mint, oregano, parsley, spring onion also work well. Thanks to Tanya and Natalia for this recipe!